Dinosaur Bar-B-Que, a northeastern-based restaurant chain, founded by Pit Master John Stage, is opening today in Baltimore. The Baltimore Post-Examiner was invited to attend its VIP preview party last night at the new location in the city’s Fells Point neighborhood. Amidst feasting on delicious complimentary servings that included Brisket, Corn Muffins, Deviled Eggs, Pork Belly Sliders, Honey BBQ Wings, BBQ Ribs, Asian Cucumber Salad, and other delights, the Post-Examiner also had the opportunity to speak with Mr. Stage. Stage, 55, a New York native, who founded Dinosaur Bar-B-Que in Syracuse in 1988, was asked why he chose to open a restaurant in Baltimore? Sage said he was approached two years ago about that possibility and began searching for a suitable spot before ultimately settling upon his current location – an old-school factory building which was once used to make boxes for Coca-Cola bottles. 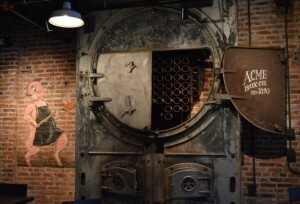 “There was this very cool building down on the other side of Fells Point, almost at Canton. It was right on the water [but] it didn’t work out [however I subsequently discovered that] I just really liked the feel of Baltimore; that’s how it happened,” Stage said. 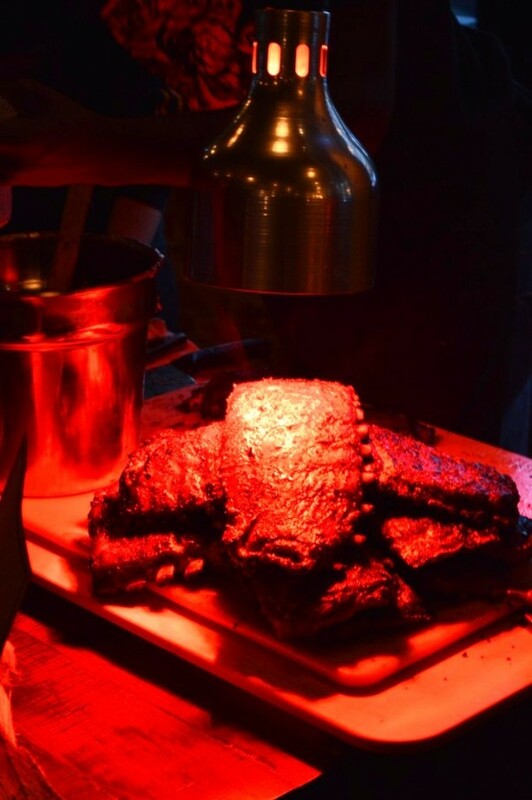 Stage also said Dinosaur Bar-B-Que’s Baltimore location is its first below the Mason-Dixon Line and tenth overall. CEO Rene de la Garrigue, a 51-year-old Texas native who runs Dinosaur Bar-B-Que, also spoke with the Post-Examiner and professed his affinity for Charm City. Among the Dinosaur’s patrons were Guilford residents Laurie and Scott Rice, both of whom said they had a great time and enjoyed their meals. Philip Allen, a 53-year-old Baltimore native, also enjoyed the new restaurant’s cuisine. When asked if he would return to Dinosaur Bar-B-Que, Allen said, “I will definitely be back to patronize [this establishment]”. The event, which drew a diverse crowd, also included VIPs such as Mayor Stephanie Rawlings-Blake, who arrived around 8:00 PM. Dinosaur Bar-B-Que opens to the general public Tuesday September 22nd at 5:00 PM. The restaurant is located at 1401 Fleet Street in Baltimore. ← Hogan vs. Kamenetz, a preview of 2018?